Beyond and behind the latest news. Chapter 247 often leads on issues that are deeply important to our members before they appear on the national radar screen. 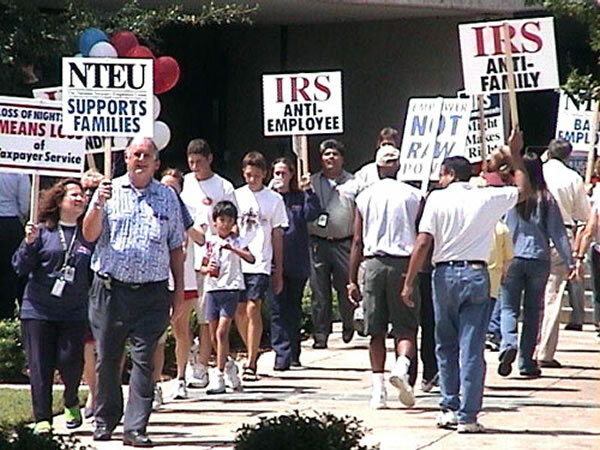 On May 27, the day after Memorial Day, NTEU Chapter 247 staged a picket against IRS Austin Accounts Management. Ignoring a federal commitment to "family-friendly" policies, local management had demonstrated unusual callousness toward employees, attacking the right to alternative tours of duty and refusing to allow employees to use the leave that they had already earned. In a mini-documentary of the event, "We Won't Back Down," Chapter 247 battles the unexpected intimidation of a Homeland Security officer (who threatens to "cite" the recalcitrant Chapter President), 96 degree heat, and management's attempt to chase away the media—all while laughing, chanting slogans, and enjoying live music…Austin, Texas-style! Click here to see the documentary of Chapter 247's picket against IRS management, "We Won't Back Down." When Contact Recording was rolled out to Austin Call Sites in ACS and Accounts Management, Chapter 247 used the forum of official briefings as an opportunity to inform employees of the protection and benefits accorded them under the Letter of Understanding negotiated between national NTEU and the IRS. Chapter 247 met with management representatives in Compliance and Accounts Management in order to hammer out the Questions and Answers that would be distributed to employees during the implementation of the new technology. Contact Recording, which enables managers to listen to playbacks of telephone conversations between employees and taxpayers long after the calls take place, can have a significant impact on evaluations and other working conditions. Chapter 247 was determined to see that local management were on the same page as the union in their understanding of the LOU negotiated nationally. This is an example of management working in good faith at the local level with NTEU for the betterment of employee rights, for the efficiency of the IRS, and for the benefit of taxpayers. In other words: Win/Win/Win. Click here to see the Chapter 247/Austin Call Sites Contact Recording Q&A. Despite an early-morning threat of rain, members of NTEU Chapter 247 at the IRS Austin Compliance Center took advantage of an opportunity to send a strong and important message to local IRS management that it is about to take a step that will hurt both employees and taxpayers. In early June, more than 100 Chapter 247 members took part at various times during a two-hour informational picket at the center to protest the dropping of the night shift and the forced movement of employees to the center’s day or swing shifts. Some members took annual leave to participate in the event; others used their break time or lunch period to march, chant and carry signs opposed to the decision. “There was a lot of enthusiasm” on the picket line, said Chapter 247 President Eddie Walker. The event drew a variety of local print and television news coverage, as well as the support of drivers who honked their horns as they passed the demonstration. The message to Austin IRS management was that its plan is unnecessary and unwise, and will disrupt people’s lives, Walker said. The night shift employees provide taxpayer assistance, including helping set up tax payment arrangements. If the agency goes ahead with its plan, scheduled to take effect on July 14, Walker said the chapter intends to file a mass grievance on behalf of the 51 affected employees. The unilateral decision to end the night shift would violate both NTEU’s and the chapter’s alternative work schedule (AWS) agreements, which have been in place since early 1996. The NTEU-IRS national labor agreement provides for supplemental agreements reflecting local conditions and needs. Walker sharply criticized the decision to drop the night shift, and particularly so in light of an earlier move by IRS Austin management that forced 80 day-shift employees with start times prior to 8 a.m. to change to later work shift starting times. The union filed a mass grievance in that case, which is now headed for arbitration. The chapter president said that if the agency believes it needs additional employees at certain hours of the day, it should work with the union to implement a Chapter 247-proposed program of voluntary transfers to that shift. That, he said, “certainly would improve” morale at Austin. The agency rejected the union proposal. The best long-term solution, Walker said, is for the IRS to hire any needed employees on the day shift. Doing so would permit present night-shift workers to continue serving taxpayers during the evening hours while allowing them to meet their family obligations. These include child care and, in some cases, the need to care for elderly parents during the day. In addition, some night shift workers at Austin, as elsewhere, work second jobs during the day. A forced change in their work shifts, the Chapter 247 president said, will present them with the choice of having to quit one or the other of their jobs. A Blast from the Past! 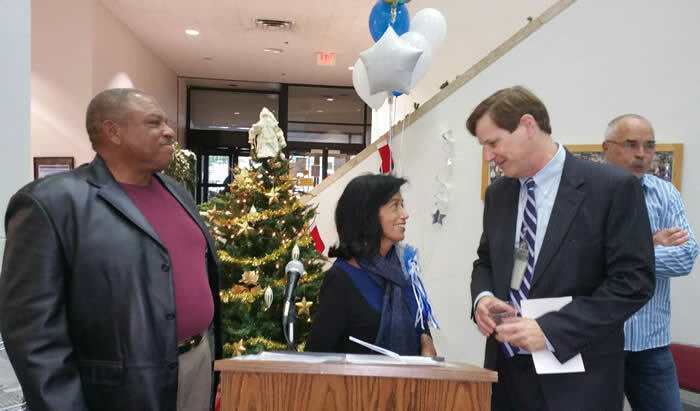 Former Accounts Management Director Charles Washington and Chapter 247 President Eddie Walker reunite to honor mutual friend Mary Ann Hernandez at Mary Ann's retirement. Chapter 247 and the ACS operation spent six months confronting the issues causing stress among ACS employees and constructing a program to tackle the problems head on. The effort goes beyond the traditional, superficial attempts at combatting stress, such as using motivational speakers and videos,, and moves ACS ahead of other operations. Convinced that stress can adversely affect both employees and business results, NTEU and management designated the ACS Advisory Council—consisting of employees selected by NTEU, teamed with managers—to undertake the challenge of reducing stress by directly attacking its causes. The Advisory Council began its mission by creating and distributing a survey that solicited ACS Collection Representatives (CRs) for their opinions, and invited them to contribute solutions. The Council reviewed the surveys, debated the issues, and submitted recommendations that were rolled out to all employees by NTEU and management, and were implemented through a joint effort. Chapter 247 hopes that the effort in ACS will serve as a model to tackle stress in other operations, so that employees will be able to concentrate on their jobs first, rather than stress. Click here to see the ACS Advisory Council Stress Survey: Reducing Stress in the ACS Work Environment. successful battle on behalf of IRS employees and the American taxpayer. 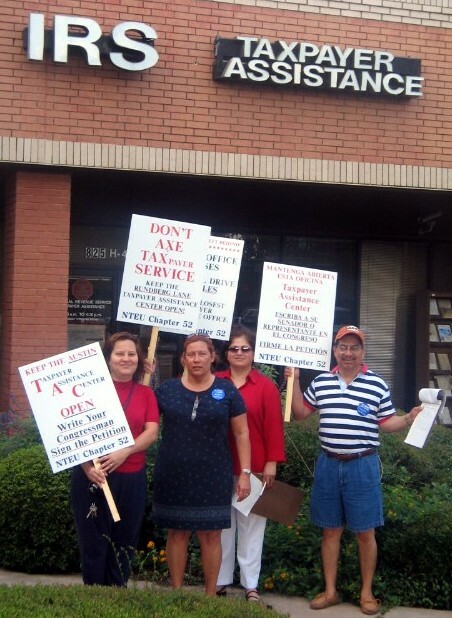 Now-retired Chapter 52 President Tom Jones led his members in a week-long rally and informational picket outside the Rundberg Square Taxpayer Assistance Center (TAC) in Austin, as part of a successful nationwide effort by NTEU to stop the shutdown of 68 TACs by the IRS. Chapter 247 does not represent TAC employees—but that did not stop its members from pitching in to help its sister chapter. As Tom Jones wrote in a letter to NTEU National President Colleen Kelley, "Chapter 247's stewards stepped up to the plate on short notice and took leave to support their brothers in Chapter 52…We…truly appreciate the support they provided us not only morally, but more importantly, physically walking a picket line in 95 degree plus temperatures, and a very typical humid South Texas summer." Tom continued, "During this week we set a goal of gathering at least 100 signatures a day on the petitions for the public to sign. With the help of Chapter 247 we far exceeded our goal and collected over 200 a day. We are on our way to collecting over a thousand signatures. Over 95 percent of the TAC customers are signing the petition and asking their family members, neighbors, and friends to come down and sign. They are also thanking us for fighting for them. This could not have happened without the support of Chapter 247." We couldn't agree with Tom Jones more when he wrote, "I know that each and every one of my stewards and members learned that cooperation between chapters is more that just words on a piece of paper."